This article outlines how to add products to your Quote record using the Upsell Manager Links. Within the CRM we have an Upsell Manager, making it easier for your sales team to add additional products to a customer's order. The Upsell Managers allows you to create links between multiple products that should or can be sold together. If an Upsell link has been configured, when the product is added the user will be prompted to see if the customer would also like the linked products. We have identified three key types of Upselling which our Upsell Manager supports; Upgrade, Must Sell & Recommended. For more information on these different types of upsell take a look at our Different Upsell Manager Links Explained article. This article assumes that the upsell links have already been configured, if you need assistance with this take a look at our Configuring Upsell Manager Links article. 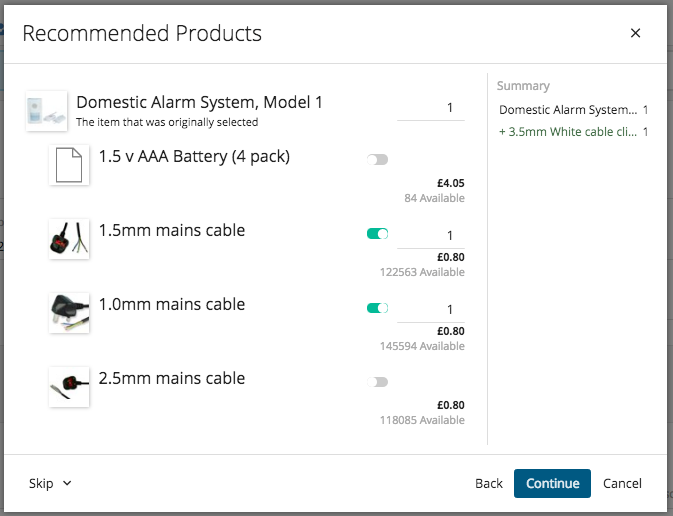 In the below example we are adding the product Domestic Alarm System Model 1 which has an upgrade, must sell & recommended products linked. Once I have added the product, the Upsell Manager pop-up will open automatically. The first set of upsell links that are displayed is any product upgrades that have been linked. Within the below example we have two upgrade options; Model 2 or Model 3. The Upsell Manager will display the price of the upgrade product, how many are available in terms of stock & finally the price difference. To choose an upgrade product just simply click on the required item & press continue. The next upsell link that shows is the Must Sell, which means that these products have to be purchased with the product being sold. Before you continue you're warned about the price & how many of this required product is being added. Finally, you have the products that are recommended as a possible upsell. To add these recommended products click on the toggle next to the desired product. Again the Upsell Manager will display the available stock & price for the user's information. You will also notice that there is a summary on the right-hand side which notes down all products that have been added so far via the Upsell Manager. Once happy with your selection click continue & all products will be added to your Quote record.